A press view was given yesterday of Buffalo Bill's Wild West Show. He has chosen an excellent site, being the buildings in Dennistoun of the East-End Exhibition, but he has made such a conversion of them that probably it would have been cheaper to have constructed the whole. As it is, many thousand pounds have been expended, and quite an army of workmen are engaged in order that the show may be opened next Thursday evening. Monday had been fixed, but the work has been so great that it will require a good week yet to get ready. The entrance is the same as in the old Exhibition, a covered archway leading up to the vast arena. 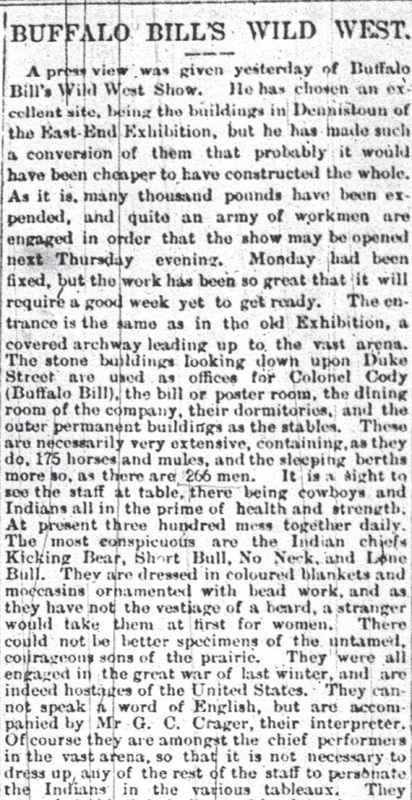 The stone buildings looking down upon Duke Street are used as offices for Colonel Cody (Buffalo Bill), the bill or poster room, the dining room of the company, their dormitories, and the outer permanent buildings as the stables. These are necessarily very extensive, containing, as they do, 175 horses and mules, and the sleeping berths more so, as there are 266 men. It is a sight to see the staff at table, there being cowboys and Indians all in the prime of health and strength. At present three hundred mess together daily. The most conspicuous are the Indian chiefs Kicking Bear, Short Bull, No Neck, and Lone Bull. They are dressed in coloured blankets and moccasins ornamented with bead work, and as they have not the vestiage of a beard, a stranger would take them at first for women. There could not be better specimens of the untamed, courageous sons of the prairie. They were all engaged in the great war of last winter, and are indeed hostages of the United States. They cannot speak a word of English, but are accompanied by Mr. G. C. Crager, their interpreter. 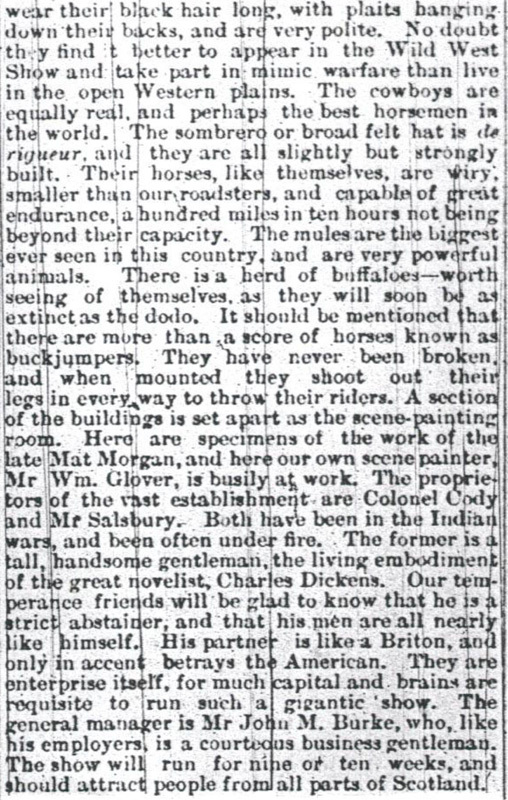 Of course they are amongst the chief performers in the vast arena, so that it is not necessary to dress up any of the rest of the staff to personate the Indians in the various tableaux. They wear their black hair long, with plaits hanging down their backs, and are very polite. No doubt they find it better to appear in the Wild West Show and take part in mimic warfare than live in the open Western plains. The cowboys are equally real, and perhaps the best horsemen in the world. The sombrero or broad felt hat is de rigeur, and they are all slightly but strongly built. Their horses, like themselves, are wiry, smaller than our roadsters, and capable of great endurance, a hundred miles in ten hours not being beyond their capacity. The mules are the biggest ever seen in this country, and are very powerful animals. There is a herd of buffaloes—worth seeing of themselves, as they will soon be as extinct as the dodo. It should be mentioned that there are more than a score of horses known as buckjumpers. They have never been broken, and when mounted they shoot out their legs in every way to throw their riders. A section of the buildings is set apart as the scene-painting room. Here are specimens of the work of the late Mat Morgan, and here our own scene painter, Mr Wm. Glover,  is busily at work. The proprietors of the vast establishment are Colonel Cody and Mr Salsbury. Both have been in the Indian wars, and been often under fire. 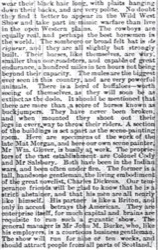 The former is a tall, handsome gentleman, the living embodiment of the great novelist, Charles Dickens. Our temperance friends will be glad to know that he is a strict abstainer, and that his men are all nearly like himself. His partner is like a Briton, and only in accent betrays the American. They are enterprise itself, for much capital and brains are requisite to run such a gigantic show. The general manager is Mr John M. Burke, who, like his employers, is a courteous business gentleman. The show will run for nine or ten weeks, and should attract people from all parts of Scotland. It is on coming to the amphitheatre and arena that the enormous size of the entertainment, not to speak meantime of its quality, becomes apparent. The range of buildings which contained the Grand Hall, the adjacent avenues, and the Fine Art Galleries, are now thrown together, and placed under one vast roof. This has not been a work free from difficulty, but it is on a fair way to successful completion. To enlarge the area without raising the roof would have given the building a very "squat" appearance. This has been avoided by raising the roof an additional 20 feet all over. The amphitheatre measures 270 feet by 225 feet, a very large portion of which is taken up by the stage and ground used for the performance. A matter of great importance with a building of this kind is the obtaining of an uninterrupted view of the stage from all parts of the house. Where pillars are employed to support the roof this cannot be secured, as everyone knows who has sat behind one, but the problem has been solved by throwing across the centre of the building an enormous iron girder 140 feet long by 12 feet deep. 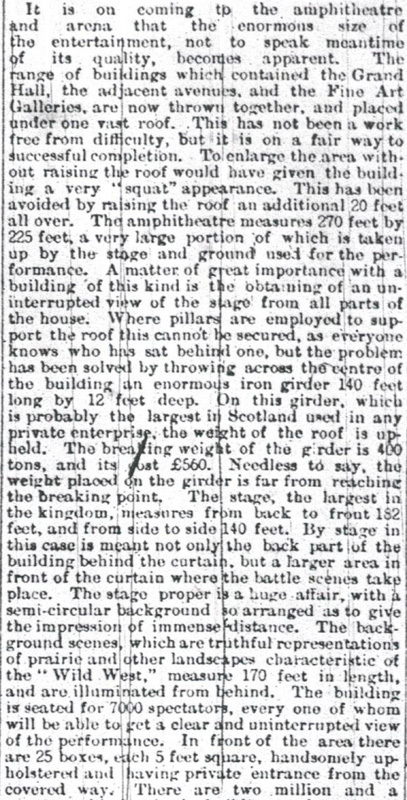 On this girder, which is probably the largest in Scotland used in any private enterprise, the weight of the roof is upheld. The breaking weight of the girder is 400 tons, and its cost £560. Needless to say, the weight placed on the girder is far from reaching the breaking point. The stage, the largest in the kingdom, measures from back to front 182 feet, and from side to side 140 feet. By stage in this case is meant not only the back part of the building behind the curtain, but a larger area in front of the curtain where the battle scenes take place. The stage proper is a huge affair, with a semi-circular background so arranged as to give the impression of immense distance. The background scenes, which are truthful representations of prairie and other landscapes characteristic of the "Wild West," measure 170 feet in length, and are illuminated from behind. The building is seated for 7000 spectators, every one of whom will be able to get a clear and uninterrupted view of the performance. In front of the area there are 25 boxes, each 5 feet square, handsomely upholstered and having private entrance from the covered way. There are two million and a quarter cubic feet in the building, and a mile and a quarter of seating, lineal measurement. The heating will be done by steam piping, of which there is about 7000 feet. In a building intended to accommodate so many people, and where so much gunpowder is blazed, the ventilation is a matter of more than ordinary importance. This will be accomplished by means of a series of "Blackman" air propellers  placed in the roof, and driven by a six-horse power dynamo. There are no fewer than ten exits, and there will be a twenty-foot wide covered avenue down to Duke Street. Besides the extension and raising of the roof, there have been very large alterations on the floor of the building, both in the way of excavating and levelling up. In connection with one of the battle scenes, where one of the parties makes a flank attack on the other, there has been excavated a long ten-foot deep tunnel leading into the arena through which the horsemen pass. In another scene a cyclone is supposed to take place. Where to get the wind is a problem much more easily solved than that on which the rain cranks are presently engaged. The colonel manages it by an arrangement of "Blackman" air propellers, which can develop by actual test a spanking breeze of 55 miles an hour. The lighting of the building is done by gas, the electric light, and prismatic calciums for the effects. In the area there will be five handsome gasaliers, requiring the full force of the mains in Duke Street. To increase the limelight effects the building internally will be painted white, and the ground will be covered with a white substance. The plans for the seating and exits were arranged to meet the requirements of the Dean of Guild Court, and that they are satisfactory may be inferred from the fact that not a single alteration was ordered. 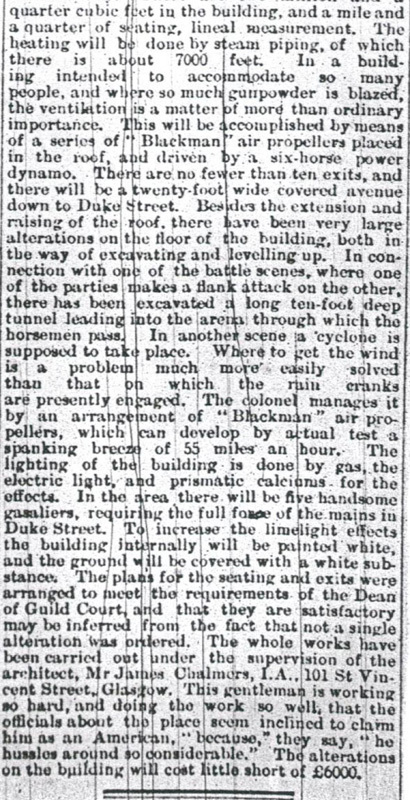 The whole works have been carried out under the supervision of the architect, Mr James Chalmers, I.A., 101 St Vincent Street, Glasgow. This gentleman is working so hard, and doing the work so well, that the officials about the place seem inclined to claim him as an American, "because," they say, "he hussles around so considerable." The alterations on the building will cost little short of £6000.